Even before the director troubles, I have never been overly excited for a Han Solo spin-off film. I think the character works best with a mysterious past, and I don't really need to know more about him. He's fine just the way he is. That being said, I like the talent they've brought on. 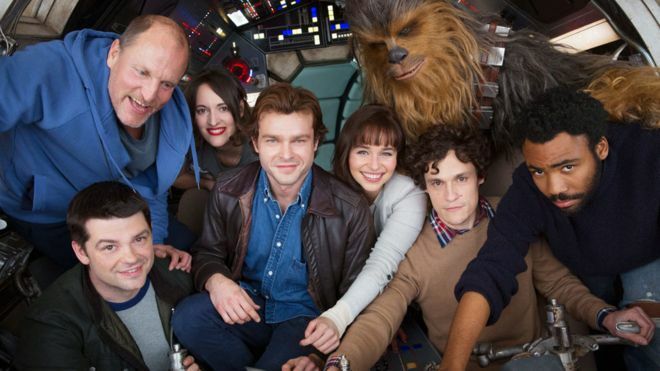 I think Alden Ehrenreich is one of the best people you could have gotten to step into Harrison Ford's shoes. Not only is there a physical similarity, but I think Ehrenreich will be able to pull off the iconic gruffness excellently. You also have Donald Glover as Lando Calrissian, which I am very excited to see on screen. Included in the supporting cast is Woody Harrelson, Emilia Clarke, and Paul Bettany, who are all great actors. So they do have a good team working on it; I'm just not on board with the concept. Then Phil Lord and Chris Miller, who were part of the reason why I was excited for the film, were fired, and Ron Howard came on the finish the job. That shook my faith in the project a lot, to the point where I don't really care about this movie at all any more. If it never came out, I wouldn't be upset. Sure, I'll go see it when it hits theaters next year, but I don't really have any true expectations for it. But with the film finally wrapping production, Howard has now revealed what the official title for the film will be. The name of the movie is now Solo: A Star Wars Story. Wow, this came completely out of left field! I was not expecting this at all! My sarcasm doesn't come across as well over text as it does in real life. We were all expecting the title to be something along the lines of "Han Solo: A Star Wars Story", and all they did was drop the "Han". It's an okay title. It's nothing revolutionary. I thought there was a chance we'd get something a little different, like "The Millennium Falcon: A Star Wars Story". But nope, we got Solo. While I'm criticizing the title's simplicity, it actually is a smart choice. Back when Batman v. Superman: Dawn of Justice was coming out, and it was still untitled, I said they should just call it "Batman vs. Superman", because that's what everyone knows it as. If they had come up with a title like "Man of Steel: The Dark Knight Returns" or something along those lines, I don't think it would have the same universal understanding as "Batman vs. Superman". So, at the same time, calling the Han Solo movie anything over than Han Solo loses that universal understanding. I guess my annoyance comes from the fact that the title has been withheld from us for so long, to the point where it felt like it was going to be a much more profound reveal. However, it's pretty much what we all expected it to be. In the end, it's not a bad title, and I do think it makes the most sense. But this does nothing to actually change my excitement level at all for the movie itself. What do you think? Do you like the new title? Are you looking forward to seeing Solo: A Star Wars Story? Leave your thoughts in the comments section below.